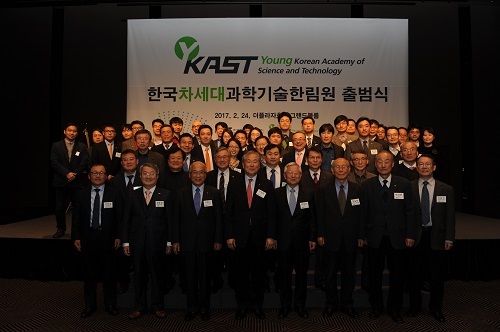 The Korean Academy of Science and Technology (KAST) launched the Young Korean Academy of Science and Technology (Y-KAST) and selected 73 scientists as its inaugural members on February 24. Among them, 13 KAIST faculty were recognized as the inaugural members of Y-KAST. Y-KAIST, made up of distinguished mid-career scientists under the age of 45, will take the leading role in international collaboration as well as innovative agenda-making in science and technology. The inaugural members include Professor Hyotcherl Ihee of the Department of Chemistry and Dr. Sung-Jin Oh of the Center for Mathematical Challenges at the Korea Institute for Advanced Study (KIAS), affiliated with KAIST. Professor Ihee is gaining wide acclaim in the fields of physics and chemistry, and in 2016, Dr. Oh was the youngest ever awardee of the Presidential Award of Young Scientist. The other Y-KAIST members are as follows: Professors Haeshin Lee of the Department of Chemistry; Mi Young Kim, Byung-Kwan Cho, and Ji-Joon Song of the Department of Biological Sciences; Song-Yong Kim of the Department of Mechanical Engineering; Sang-il Oum of the Department of Mathematical Sciences; Jung Kyoon Choi of the Department of Bio and Brain Engineering; Seokwoo Jeon, Sang Ouk Kim, and Il-Doo Kim of the Department of Materials Science and Engineering; Jang Wook Choi of the Graduate School of EEWS (Energy, Environment, Water and Sustainability); and Jeong Ho Lee of the Graduate School of Medical Science and Engineering. The leading countries of the Academy of Science, which include Germany, Sweden, Belgium, Canada, and Japan, have established the Young Academy of Science since 2010 in order to encourage the research activities of their young scientists and to establish a global platform for collaborative research projects through their active networking at home and abroad. President Myung-Chul Lee of KAST said, “We will spare no effort to connect these outstanding mid-career researchers for their future collaboration. Their networking will make significant impacts toward their own research activities as well as the global stature of Korea’s science and technology R&D.